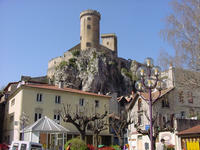 We spent the day in Foix in the Ariege Department, which is one of the most remote parts of France. As the tourist books say, everything moves at a snail's pace, but the setting is spectacular. You're in the foothills of the Pyrenees, filled with valleys and castles and caves and forests, with the snow covered mountains above. Another thing I notice while traveling is how dependent I normally am on a certain bandwidth of information. Like, in this weblog, I do sort of write whatever is on my mind on what I come across. However, when I'm home it is based on having browsed through quite a number of different information sources, RSS channels, news sites, e-mails, etc. Sitting by my computer most of the day with a broadband connection makes that easy and natural. But if I'm traveling around and have just a dial-up connection at a hotel for a couple of hours at night, it is a totally different thing. Not possible to get much overview of what is going on in the information world. There are good things about that, of course. It is great to focus on some 'real' experiences. But I'm also looking for ways of not loosing touch. New kinds of tools. Even if I did have a computer with me at all times, with a wireless broadband connection, I probably wouldn't want to be maneuvering web browsers most of the time, if there is a lot of action in my immediate surroundings. I'd like some tools that are more integrated into life, not requiring you to give them full attention for hours. One issue is the amount of bandwidth (connection speed and time) available. But another is the interface you have to the information world. If you're driving a car, a menu would be a very bad user interface to anything. If you are walking around, an e-mail program or web browser is not very useful. But I'd still like to be connected with things in other places.